Sweeten your coffee and tea to perfection with this Regal Foods 1 gram blue sugar substitute packet! This aspartame sweetener is just what your restaurant or cafe needs. Opposed to bulk sugar, this sugar substitute is pre-packaged in 1 gram packets for your patrons to grab on the go. Offer this packet at your party, coffee shop, or concession stand, and your guests will have just the right amount to flavor each of their hot beverages. It's also excellent for your hotel's in-room coffee service, as your patrons can sweeten their freshly-brewed coffee as they please. Look no further than Regal Foods for all of your sweetening needs! Cost effective and conveniently-packaged, this Regal Foods blue sugar substitute makes a smart addition to any venue. This is a great quality and value blue sugar substitute sweetener. The packets are well packed into the box and none arrived broken or tore. The shipping was very quick, and no damage to the packets inside. Well worth it for the price, also get the other packets for variety. We purchased this because it's much less expensive than the brand name stuff. Taste is the same and customers have never had an issue with it. Highly recommended. This is a great cost effective solution for "Equal". Customers can't tell the difference and we recommend to all. We keep these on all Of our tables for coffee and tea. Great alternative to the name brand sugar substitutes out there. Most people don't seem to mind so I'll continue using this product. Great price too. A great product for the price. Same product as the name brand. Our customers only care about the color and not the name. I highly recommend this product if you are trying to watch costs especially for a small business. Over time we've started transitioning to the Regal Foods brand of sweetener packets. Our customers tell us that the quality is exactly the same as the name brand products and we're glad to pay a fraction of the cost! This is a great substitute to the brand Equel. I honestly think that it is better than Equal. Equal does not dissolve easy and this packet does. This works just as good as equal and maybe even better. I use regal sweetener in my coffee and teas and it gives me the right sweetness that I need. Great alternative to pricey name brand sugars. Our customers compliment us on the quality of the sugar as well as the freshness & ease to use. These come in perfect packaging and easy to use. Everybody's favorite and the best price is always from webstaurant. Super fast shipping and helpful staff make these a no brainer. These are a good off brand sugar at a good price. The only complaint I have is that the paper gets sticky with just a little bit of moisture. Good product and excellent value taste great in our drinks, the only criticism we might have is that when you open the box they are loose in the packaging with no separation. 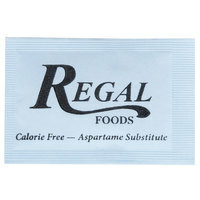 The Regal Foods blue sugar substitute packet is great and perfect for our catering business. The sugar has a great taste and excellent for serving with tea. Amazing value! My customers love the fact that it tastes just like equal. I actually think it tastes better. Regal has enabled me to provide quality products with a savings. This is comparable to Equal. Works great to sweeten your drinks. No bad aftertaste, we use this daily for tea and think it's great. I will definitely be purchasing again and would recommend it to others who use equal. Inexpensive sugar substitute, we haven't had any complaints about the taste or quality and people don't seem to mind it not being name brand. One complaint we have is that not all the bags are cut and so you will get two, three or four packets that you have to be eversole careful with and tear them apart. But other than that great product, quality and price. A much cheaper alternative to the name brand blue packet, and I've not heard any complaints from customers. I would definitely recommend these unless the name brand logo is important to your customers. Great value over the name brand counterpart. Customers love it. The packets are sometimes stuck together though and sometimes can rip when trying to get them apart. The blue sugar substitute packet is the perfect sweetener for our bakery and a great price. Our customers love it and so do our staff. The most common sugar free sweetener. Most of our customers who use sugar free sweetener use this in our esspreso shop. Same as Equal brand. A very good sugar substitute! I use the packets in baking and sauces, about 6 to a tsp. My biggest complaint is that sometimes the packets are not all the way sealed. The regal foods blue sugar substitute packet is a perfect item for our condiment coffee bar at work. Some of the customers are watching their sugar and this is a great option. A really nice blue sugar substitute packet that is perfect for our coffee shop. Easy for customers to grab and take with them with their to go orders. Excellent flavor and with the 2000 pack case, it is very economical. The WEBSTRAURANT STORE is our one stop shop for supplies. Excellent website and fast service. We wanted a selection of sugar and sugar substitutes for our coffee business. The regal foods options are priced excellent and we have never had any issues with the packets. We are very happy with the selection, quality, and price! These are just as good as the popular named brand of aspartame. Regal foods is a good company which offers quality products at low prices. My most popular sugar substitute. It is included in all of my rooms as part of the in room coffee service as well as a standard in the dining room. We bought this, instead of the name brand, in the name of frugality. Customers haven't had any issue with it. They just as for "the blue sweetener". They couldn't care less about this being a generic brand. Packaging seems fine, taste seems to be the same. A few packages seemed to be leaking on arrival when we took out to fill containers but that is typically expected in that type of pack. Great product for my self-service coffee counter. I have had no complaints from customers about this brand. It seems to interchange well with Equal and costs less. Compare to brand name. We have been using this brand for a long time and customers seem to like it. These packets for well in the sugar caddies. Always looking to cut office expenses after some quick math we found we could cut our cost in half. Great flavor and sweeter per pack, so that will cut costs additionally. Win win. The regal sugar substitues are cost efficient and come in the colors that customers are familiar with from other sugar substitutes. The box lasts a long time at our high volume restaurant. These are perfect for my coffee shop - they look nice and people seem to enjoy using them. Great product at a great price, can't beat that! This is a no-brainer. It's one of the sweetest "blue sweetener" type packet sweeteners on the market, at a better price than any other we've found. Your customers will love the taste in their hot or cold beverages, and if you use aspartame packets in your desserts, you'll appreciate the ability to use fewer packets, as well as the low per-packet price. Regal 1 Gram Blue Packets are the "secret" to our low-carb homemade Egg Nog. A must for those who do low-carb lifestyles.